Rooted in the Sikh tradition and the universal teachings of its Gurus, Gobind Sadan, “God’s House Without Walls,” is an international interfaith community currently with centers in India, and in the U.S., which has grown out of Baba Virsa Singh ji’s vision for world peace. This site offers sacred material from all traditions for contemplation. It is our hope that people of all faiths—or no faith—will find spiritual refreshment, relief from stress, inner empowerment, strengthening in faith, and healing here. 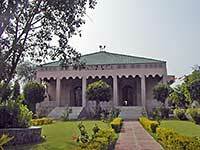 Gobind Sadan is a place of pilgrimage for all people. It’s a farm-based spiritual community with locations in India and the United States, combining hard work and meditation under the blessings and guidance of Baba Virsa Singh Ji. Babaji teaches the universal messages of all prophets and transforms people through love, faith, meditation and service. He does not seek any charity or followers. Gobind Sadan is staffed by volunteers. The farm income is used to uplift the materially and spiritually poor. The farms are miracles of land reclamation in previously barren wastelands. They demonstrate the reality of God and the power of faith. 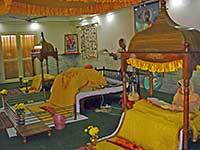 Miraculous healings are also everyday occurrences at Gobind Sadan where devotions proceed around the clock. 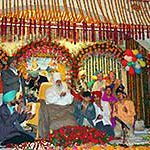 Baba Virsa Singh ji’s communities in India and the USA are also in formal schools for training the mind towards love of and faith in God. 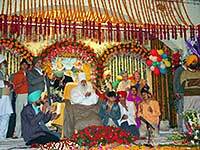 People from all over the world come to these spiritual places as volunteers and as worshippers of the One God. 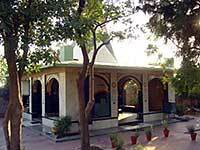 Baba Virsa Singh ji is usually in residence at his devotional centre in Gobind Sadan, South Delhi. When he and his sevadars began work there in 1968, the land was considered nearly worthless. The land was arid, gutted with ravines, thorny, treeless, and uninhabited. 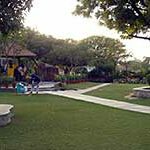 Now it is a peaceful paradise of orderly irrigated fields of vegetables and forage crops, gardens, tree-lined pathways, sacred places, community kitchen and living quarters. A small staff of volunteers from many different backgrounds live and work together at Gobind Sadan in Delhi. Many more visit for Babaji’s guidance and blessings, for devotional practice, and for volunteer service. They also come for physical and mental healing, for the spiritual vibrations and blessings are very strong where God is always loved and remembered. Through the years, Babaji has repeatedly gone into barren places and transformed them into exceptionally lush fields and devotional centers which have become havens of peace for people of all religions. 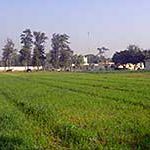 The biggest farm in Baba Virsa Singh’s practical program is Shiv Sadan, developed in a previously flood-prone area on the banks of the Ganges near Garh mukteshwar in Uttar Pradesh. 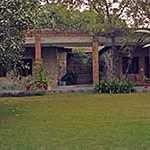 When Babaji began developing this huge area in the late 1980’s, no one could imagine that it could be farmed. The area was marked as wasteland in government surveys. There were no roads, no electricity, no telephones, no health care, and no schools—just buffalo cart tracks, and a few crude camps in a sandy, alkaline, treeless wasteland of coarse grasses and marshes. By tremendous faith in God and hard work, Shiv Sadan has now been turned into one of the most productive farms in India. 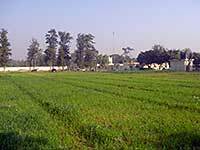 Its major crops are wheat, rice, sugarcane, and oil seeds, with a variety of vegetables grown for seed production as well. The income from the crops and seeds supports services for the poor—including free medical camps, langar (free kitchen), and a school. 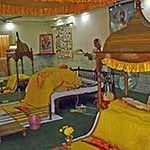 Shiv Sadan’s living areas include a guest complex, offices, havan’s (eternal sacred fires), Darbar Sahib (housing the Sikh scripture, the Guru Granth Sahib), as well as central dehra and Tejpurj. There are also machine repair shops, agricultural processing, and storage facilities. 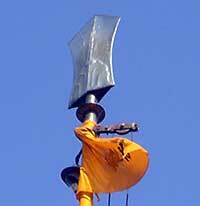 Babaji says everything in Shiv Sadan is for the people. Baba Virsa Singh has also developed farms in Shahjahanpur and Surajpur, Uttar Pradesh, and his native village in Punjab—Sarawan Bodla. 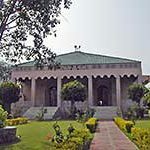 The latter is considered an especially sacred site, where pilgrims and volunteers sit in meditation and devotion under the same Ber tree beneath which Baba Virsa Singh sat so often in meditation as a youth. The leaves, fruits, and even mud from the base of Darbar Sahib are prized for their healing properties. 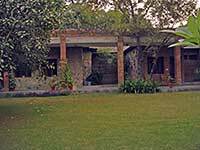 Gobind Sadan, USA is a farm north of Syracuse, New York founded by Babaji. It draws together people of all religions who work together to offer spiritual and social uplift to those in need. Babaji’s communities are living demonstrations of the success and blessings that come from hard work and loving faith in God. 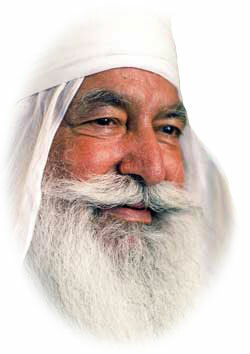 From the fields or gardens where he directs the farm and community operations, Baba Virsa Singh speaks to people of all faiths and social positions from poor laborers to military officers, government officials, agricultural specialists, and world religious leaders. He tells them: “All the Prophets have come from one Source. They did not come to build religious institutions as walled forts, they came to change our consciousness. They came to teach us how to live. Sectarian divisions have been created by religious ‘authorities’, out of self interest. Ignore them—we are all sisters and brothers, with one parent. “Religion is meant to be practical,” Babaji says, “not theoretical.” If we work hard to support our selves and share with others, meditate in remembrance of God, recognize God as the Doer and Giver of everything, and keep our minds clean, tender, and full of faith and love before God, we will all be blessed and happy, and the world’s problems can be solved. Babaji transforms weak people as well as barren lands, by helping us to discover the power of God hidden within ourselves. He says, “God’s grace gives the power and energy for successful development. God’s light and truth are within us all, and God is so powerful. When people who love God work together, their combined energy is very great and there is progress.” Gobind Sadan’s programs are self supporting. No outside funding is solicited and everything is free. The staff and visiting volunteers live simply, creating a surplus far beyond their own needs which is used to provide services to the hard working or disabled poor, and to celebrate the holy days of all religions. Baba Virsa Singh recommends a powerful spritual program: Recite Nam (God’s name), read Jaap Sahib (the empowering hymns of God’s praises by Guru Gobind Singh), do seva (volunteer service), and rise early in the morning to begin thanking God and looking within yourself to battle with your own evils. 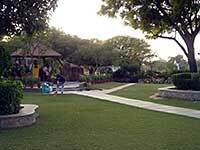 At all of Babaji’s communities, havan (tending the eternal sacred fire), is conducted around the clock. Havans are powerful places for doing battle with the darkness within us and for welcoming the light of God to come forth. While sitting at havan, devotees meditate and affirm God’s power by recitmg Nam and Jaap Sahib. Reading from the Guru Granth Sahib, the great nonsectarian Sikh scripture, also goes on around the clock. Combining work and meditation, volunteers often do strenuous manual labour from dawn to dusk, raising lushly productive crops with yields far exceeding those in the surrounding areas. The sevadars do not tire; they feel invigorated and blessed by the work. As they work, Babji encourages them to silently recite Nam to clean their minds. The Nam which they offer is “Ik Onkar Sat Nam Siri Wahe Guru” (“There is one God, who is the Truth, Supremely respected and Wonderful beyond description”). 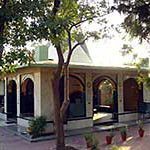 People of every background also pray before the tombs of Muslim pirs, which are highly revered at Shiv Sadan and Sarawan Bodla, and “Jesus’s Place,” where Jesus appeared to Babaji at Gobind Sadan Delhi, showering healing blessings. Blessed water from Jesus’s feet and oil from the oil lamps and ash from the havan are prized for their healing power. Babaji emphasizes that the greatest treasure people can carry from these places is obedience to God’s command. Religion is not a matter of outer rituals, he stresses. It is a loving inner surrender to God’s eternal teachings.